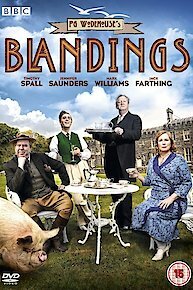 Blandings is a British comedy based on the Blandings Castle Stories, by author P.G. Wodehouse. The series is a comedic depiction of Lord Elmsworth in 1929 at Blandings Castle. He lives there with sister Connie, and his son Freddie. The show also outlines their many houseguests, nieces and the many boyfriends. Lord Elmsworth's deepest desire is simply to be left alone with his prize pig, but this never seems to occur. His family is constantly creating drama and adding comedic and frustrating moments to his life. The series also depicts Lord Elmsworth's butler, Beach, loyal and always somewhat helpful. The show depicts the antics of a cast of comedic characters and family members, who often find themselves in troublesome situations. Lord Elmsworth is often attempting to avoid family members, and avoids interacting with them by going to extreme means to avoid their company but never is quite able to pull it off. The series includes such depictions as elder sister Charlotte threatening to stay on indefinitely at the castle, or younger brother Clarence threatening to publish a memoir, which threatens to expose secrets of the family. Other episodes include a cast of friends and other family members who equally complicate and add comedic drama to the episode. Clarence's bid to win the Pumpkin prize is threatened by Connie's ambition to marry Freddie off to Sir Gregory's niece. Hannibal Didcot is bullying Clarence over a fake painting, so Connie encourages Hannibal to propose to wealthy American, Vanessa Polk. Galahad and Freddie have other ideas. Connie is trying to impress Colonel Fanshawe, in the hope that Clarence might succeed Fanshawe as Lord Lieutenant of Shropshire; but Beach is behaving very oddly indeed. Clarence has grown an appalling beard, to the dismay of Beach and Connie, but Freddie needs Clarence to convince Hollywood starlet Pauline Petite of his bona-fides. Clarence must prevent his younger brother Galahad publishing his scandalous memoirs and ruining the family name. If he fails, Connie will exile him to hellish London. Clarence and Connie's even more terrifying sister, Charlotte, is threatening to take up residence at Blandings. Permanently. Freddie comes to the rescue with an audacious plan to steal the Empress. The poker-wielding Duke of Dunstable threatens to have Clarence committed for pottiness, so Beach and Freddie hatch a plan to rescue him. Eggs required. It is the annual fete at Blandings Castle, and Connie will again force Clarence to wear a revolting top hat and stumble his way humiliatingly through a speech. Worst of all, he is banned from picking his beloved flowers by the tyrannical head gardener Angus McAllister. However, Clarence befriends Gladys and Ern, two cheeky schoolchildren who encourage him to assert himself. Connie is naturally scandalized, and brings her howitzers to bear on the ghastly intruders. Freddie - needing to touch his old man for some cash - struggles to help Clarence and the children; inevitably he makes everything worse. Clarence's lugubrious niece Gertrude has been imprisoned at Blandings by Connie and forced to overhaul Clarence's library. Her ministrations are driving him crazy. Gertrude's forbidden love, the outstandingly clumsy Revd. Beefy Bingham, infiltrates Blandings using a false identity. He is determined to win Clarence's approval for the match. Meanwhile, Freddie has inadvertently married a Portuguese exotic dancer and must do his utmost to keep that a secret from Connie. Connie is anxious to make a good impression on her visiting childhood friend Veronica, and her rich American husband, Jimmy Schoonmaker. She enlists the services of the pathologically fastidious secretary Rupert Baxter to purge Blandings - and in particular Clarence - who is liberally anointing his roses with stinking manure. Meanwhile, Freddie has fallen madly in love with dog-lover Pandora and attempts to impress her by becoming a dog-food salesman, much to his Aunt Connie's exasperation. Clarence needs to be able to get his pig eating again or he will lose the Fattest Pig prize to his rival Sir Gregory Parsloe-Parsloe. Connie demands that he put a stop to his niece Angela's love affair with ex-cowboy Jimmy and push her towards the noxious Lord Heacham. Blandings is currently available to watch and stream on BBC One. You can also buy, rent Blandings on demand at Amazon Prime, Google Play, iTunes online.